This day brought out some interesting things. I’ll talk more about that later, but it definitely caught me by surprise. Today the lesson was still working through our “obstacles to restoration”. Isaiah 61 is one of my most favorite chapters in the Bible, and it was totally appropriate for the author to reference part of it. Most of my obstacles reside in the battlefield of my mind, but there have been some trials in my life too. I totally did not realize that God keeps track of our tears. It must be important to Him when we hurt, because otherwise why would He keep a record of them? I know He uses trials and battles to send us to Him. He knows the solution. He is the solution. The author talks about King David’s humble beginnings as the little shepherd boy. His life was transformed by God. Our lives can be transformed too, with God’s power. There are so many accounts in scripture of this as well. When we begin to view our obstacles through God’s perspective, they lose their power over us. This is what I want. I want to trade in my ashes, mourning, and despair for His provision of beauty, gladness, and praise. Of course I listed the death of my son, Bryan, as one of my “challenging experiences”. I remember being so incredibly angry with God. I was going along fine today. I even ate lunch in a restaurant with some delicious food, and I was able to be present and pay attention. I stopped when I’d had enough even though it still tasted soooooo good. However, I had a really weird reaction to grocery shopping. At first, I was smiling thinking about all the yummy food that would be available over the next couple of weeks. As our excursion continued though (we go to 3 different stores), I became more and more depressed. I wasn’t entirely sure why I was getting upset, but it was clear that something in me was triggering diet mentality. I should have stopped and prayed immediately, but I just pushed it aside, trying to ignore it (read: trying to “overcome” by my own strength). By the time the Husband and I got to the restaurant for dinner (we were having a birthday celebration), I was an emotional mess on the inside. I ended up eating past “enough” at dinner and went home where I had cake and such. I felt yucky full. Not pukey full, but it still wasn’t pleasant. Finally I asked God what on earth was going on with me. He showed me that I was becoming depressed by the realization that I likely would not end up eating everything I was buying. I became freaked out by the fact that I am naturally eating much less food and that there would simply not be enough room in my stomach to hold it all. Ok, so, maybe you think this sounds absolutely crazy. That’s fine, but I was just as shocked by this revelation. Still, it is quite likely this pattern of thought has plagued me before. I mean, some of my behaviors clearly indicate a fear that I won’t have enough food. I get really antsy the more and more bare the cupboards become, and I feel calmer after a grocery run. So, it was odd for me to feel anxious when I was “stocking up”. This path of thinking (left unchecked) ended up morphing into unwarranted feelings of deprivation…. which led to “gasping for food” (Spinardi). God showed me how flawed my thinking was (and I totally agreed it was an irrational fear). He reiterated, “Food is not your joy. I AM. Food does not fill the void. I do.” I am not deprived when I eat within hunger/fullness. It’s ridiculous to think that overeating is somehow beneficial to me, it isn’t. 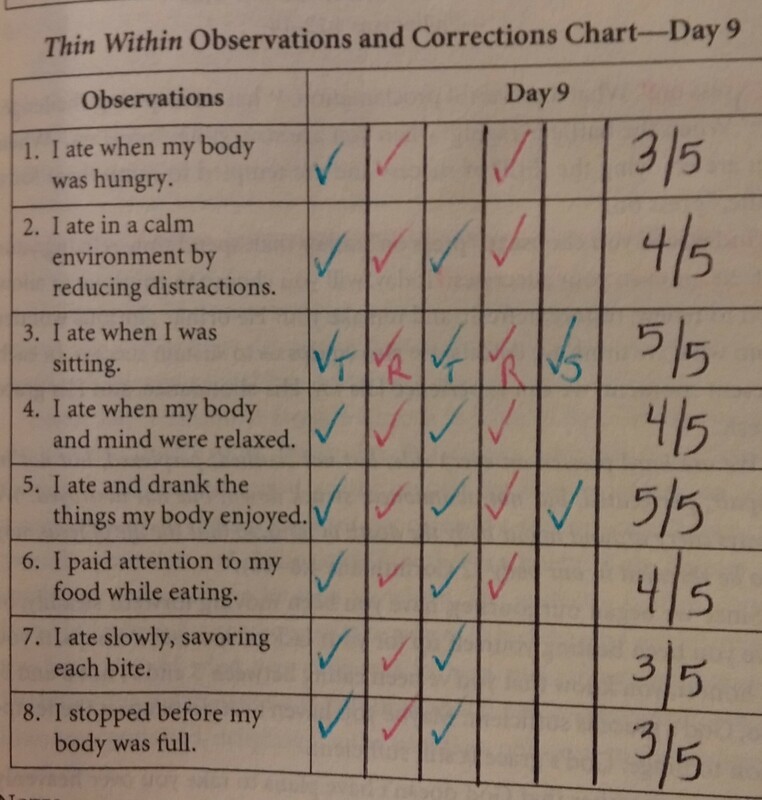 So, by paying attention to hunger/fullness, I’m actually taking better care of my body than if I give into the fears that triggered this overeating episode. Having “enough” is far from deprivation. It’s living in that sweet spot between feast or famine… yeah, it’s kind of scary when you aren’t used to it.